Although the City of Loveland was established in 1881, many believe the first settlers arrived around 1858 creating a settlement called Miraville. One of those settlers, Mariano Medina, established a stage coach station for the Overland Stage Line which eventually became Fort Namaqua and the location for a federal post office. 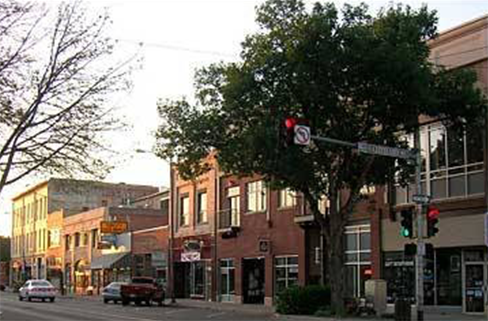 For a timeline of Loveland's history, click here. Around the same time, the first phase of homesteaders began to arrive establishing farms in the Big Thompson Valley around Devil’s Backbone and the Big Thompson River. Namaqua continued to grow under Medina and then-postmaster Hiram Taddler; but as Medina’s health began to turn, so did the fortunes of Namaqua. By the time Medina died in 1878, Namaqua had faded into history. Markers for the Medina family graves can be found at Namaqua Park in the far west part of Loveland just south of Highway 34. As Namaqua was withering away, another settlement in the area was beginning to flourish: St. Louis. The settlement gained its name thanks to Andrew Douty, the owner of a flour mill in the area, who was printing “St. Louis” on his flour bags as a marketing ploy. In 1873, a new flour mill owner arrived to the area, David Barnes. Barnes and his wife, Sarah, moved their family from the then boomtown of Golden, Colorado, to a 320-acre farm north of the Big Thompson River and between Namaqua and St. Louis. Barnes had learned from his good friend, William A. H. Loveland, the president of the Colorado Central Railroad, that a newly constructed line of the railroad would be extended from Denver to Fort Collins and eventually Cheyenne, Wyoming. Although Barnes was raising wheat on his farm, he immediately began platting a new town on an 80-acre site next to the surveyed line of the railroad that went through his wheat field. In 1877 Barnes donated part of his farm to the railroad for its right-of-way. By December of 1877, the railroad had its depot complete and ready for service. Construction of the town began without delay in the spring of 1878. Merchants from St. Louis began to relocate one mile upstream to Loveland and brought their buildings as well to be closer to the railroad. Homes began to follow shortly thereafter and on May 11, 1881, the residents voted to incorporate. Although many felt the town should be named Barnesville, it’s not without coincidence the farmer and developer David Barnes chose to name the town after his good friend, W.A.H. Loveland. The railroad helped Loveland establish itself as a shipping point for farmers, ranchers, and even lumber suppliers. This led to the town’s rapid growth, as Loveland had approximately 250 residents in 1882 and by 1885 its population had surpassed 900. Loveland had also gained its own weekly newspaper, The Reporter, the predecessor to the present community daily, the Loveland Reporter-Herald. In 1901, the Great Western Sugar Company built a factory in Loveland, which remained a source of employment until its closure in 1985. In 1902 the town reconstructed the train depot which is still present today, operating as the Sports Station American Grill, a popular sports bar and restaurant in downtown Loveland. For the first half of the 20th century, the town was dependent on agriculture. The primary crops in the area were sugar beets and cherries. During the late 1920s the Spring Glade orchard was the largest cherry orchard west of the Mississippi River. At that time the cherry orchards produced more than $1 million worth of cherries per year and why Loveland holds an annual Cherry Pie Celebration the second Friday in July. Unfortunately, a series of droughts and a shortage of canning supplies caused by World War II destroyed the industry. By 1960 cherries were no longer farmed in Loveland as the industry wasn’t able to compete with cherry growers in California and Michigan. In the second half of the 20th century, a new gold rush was established: jobs! Loveland diversified its economy by successfully courting Hewlett-Packard who established a large manufacturing facility in the Southwest section of the city. A number of other companies followed, either locating in Loveland or in neighboring cities including Fort Collins, Greeley, and Windsor. Today, Loveland, Colorado, has become the center of the one of the nation’s fastest growing regions, Northern Colorado (also known as “NoCo”). Within the region you’ll find great international companies like Owens-Illinois, Vestas and Woodward; and within in Loveland itself, companies like Agilent, Hach, and Kroll Factual Data. Loveland has strategically positioned itself by incorporating the interchange of Interstate 25 and U.S. Highway 34. This fast-developing area known as Centerra has led to construction of several shopping centers, a new medical center, the Budweiser Events Center and the new Embassy Suites Loveland Hotel, Spa & Conference Center with 40,000 square feet of flexible event space. This growth in Loveland continues as businesses like Agrium and Crop Production Services have located their regional headquarters to Loveland in 2010.